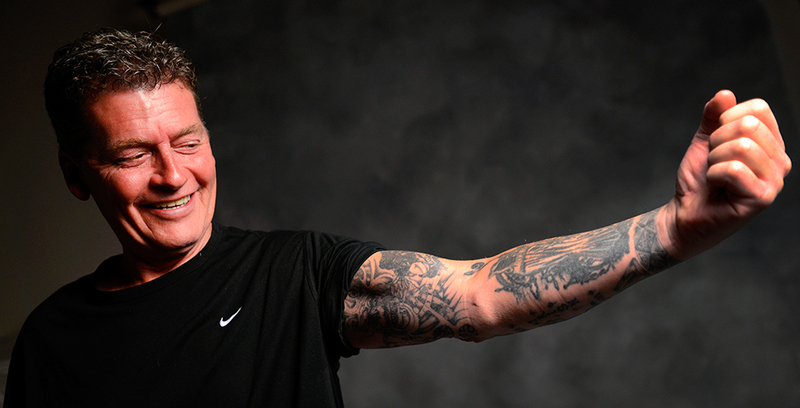 Dennis Monaghan got many of his tattoos in jail. He is now a devoted Christian. No matter how hot the weather, Dennis Monaghan always wears a long-sleeved shirt the first time he meets someone. He rolls up his sleeves and both arms, from wrists to shoulders, are completely covered in ink. There are the birth dates of his two oldest sons, a Celtic band around his wrist and a Fighting Irish leprechaun with his dukes up, an homage both to Monaghan’s Irish heritage and his propensity to scrap when he was younger. There’s a Guns N’ Roses tattoo dedicated to one son and an intricate piece of calligraphy that reads “Life” one way and “Death” when read upside down. He once had a Dennis the Menace tattoo, holding a slingshot with the catchphrase “That’s Me,” “but when I was in the pen, I got it covered up,” he said. One of Monaghan’s tattoos is a book and the number 91, a sly reference to his murder conviction in the Racco case. A marked man, literally and figuratively. Monaghan is now 56, calm, clean and a doting grandfather to his seven grandchildren. His conversations are peppered with references to God and the spirituality he has embraced for a number of years. He recognizes there are people who knew him long ago as a brawling, intimidating thug who will refuse to believe he’s a changed man. “But ever since I’ve been pardoned by God, I don’t give a s— what man says. “I’m not the aggressive person that I was and I’m not the f—ed-up person that I was,” he added. “I’m not afraid what man can do to me, not the Mafia or anything else,” Monaghan said. “I’m at peace. I thank God. It’s Him, not me. Monaghan grew up in Dundas, the fourth of eight children. His father was in charge of leasing for Fairview Chrysler in Burlington. His clients, ironically, included the OPP and Halton police. Trouble started during high school at Dundas Highland. He began skipping classes and hanging around a pool hall, drinking and taking drugs. Monaghan refers vaguely to traumatic events when he was young, then steers the conversation in another direction. He has acknowledged he was sexually assaulted outside his house when he was about 12 years old by a person who was dating a member of his family. He was eventually expelled from high school after a fight with a teacher. At 16, it was time to find work. Monaghan’s first job may well have cemented his path. 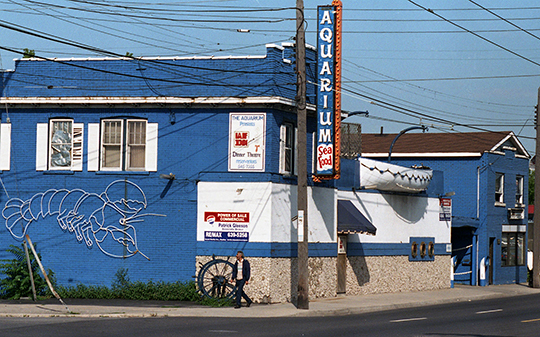 He began parking cars and acting as a greeter at the Aquarium restaurant on Barton Street East. The business was owned by the late Peter Montour, a convicted drug smuggler and one of the founders of the Grand River Enterprises cigarette manufacturing operation at Six Nations. One of the Aquarium’s employees was an explosives expert who also worked for the Musitanos. Monaghan recalls a time the bombmaker handed him two bags and told Monaghan to hide them in his house. When Monaghan returned them, he stuck everything into one bag, not knowing he was handling blasting caps and explosives. Graham Court, now 59, emigrated from England to Canada as a young boy and his family settled in Dundas. Like Monaghan, he also played a variety of sports. Behind the scenes, though, Court’s family life was chaotic. “This continued until the age of 10 when my mother gathered enough courage, strength and support to leave my father and to build a life for myself and my brother,” Court said. “As a result, she had to work very hard to provide for us. I spent the next few years bringing up myself. “I sought out unhealthy relationships that fed my need for attention, continued to struggle with the emotional trauma of my childhood and turned down the path of crime,” he added. Graham Court was deported to England 17 years ago. He married young, had a son and, by all appearances, a decent life; he had a good job and a house they purchased. “However, at the time, this didn’t seem to be enough,” Court said. “I struggled to keep my focus on my successful life and my family. “Instead, I continued to pay more attention to the undesirable acquaintances in my life, struggled with my own alcohol problems and continued to have brushes with the law. “At different times, I would feel as if I was beginning to settle down; however, it seemed as though the criminal element kept slipping back into my life,” Court added. Monaghan and Court met sometime in the mid-1970s. Court would eventually amass a lengthy list of convictions, beginning in 1976 when he acted as a getaway driver in a restaurant robbery. His crimes included break and enter, assaulting a police officer, drunk driving, prowling by night and a weapons offence for carrying a sawed-off shotgun in a duffel bag. He said he has since received a full pardon from the Parole Board of Canada. Court had a connection to the Musitanos. Court and Monaghan began doing jobs for them. The jobs were often dangerous — major insurance frauds that included burning buildings and houses, torching cars, extortion and roughing people up when necessary to send a message. Occasionally, an errant explosion would send him flying off someone’s front porch. “In no way do I ever want to glorify that part of my life,” said Monaghan. “It is undoubtedly the worst time of my life. “The insides of me didn’t match the outside for some reason,” he explained. “I was an egomaniac with an inferiority complex, and I was motivated by fear. Monaghan used drugs and alcohol to numb the fear. He also used his connection to the Musitanos to his advantage. “It wasn’t really respect; it was more of a fear thing,” Monaghan said. “People fear you and I think that was, for me, a tool to keep people away from me. “They feared me and I was unpredictable. I fought a lot, in the hotels. For Court and Monaghan, the 1984 Thanksgiving weekend would mark the start of their downfall. At 381 Barton St. E., between Wentworth Street North and Victoria Avenue North, stands a drab, beige-coloured building with a collection of street-level storefronts that have long since been converted into shabby apartment units. But back in 1984, the middle shop was home to Rutledge Confectionery, a small variety store owned by 76-year-old William Alexander Rutledge. Known to his customers as Alec, Rutledge lived alone in a room at the back of his store. Out front, he sold the usual variety-store fare — cigarettes, pop and sweets — but that was just a small part of his business. He also cashed cheques. Stelco workers would sometimes be lined up outside the store waiting to get their cheques cashed, neighbours said. It was the cheque-cashing part of his business that led to his bloody death. According to Monaghan, Court had been tipped off that Rutledge had a lot of money stashed in a safe at the back of his store. 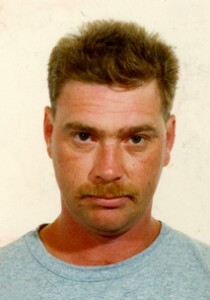 The tip had come from Aldon Schlosser, known as Skippy to police and members of Hamilton’s underworld. Schlosser, who died in 2011, was a friend and criminal associate of Peter Montour’s, the owner of the Aquarium. On Saturday, Oct. 6, 1984, Monaghan spent much of the day drinking at the Coach House Hotel in Dundas. He and Court had decided to rob the safe in Rutledge’s store. Newspaper accounts suggest Court and Monaghan showed up at the shop together and, when Rutledge opened the door, Court gave him two quick cracks to the head. When Rutledge refused to give them the combination to his safe, Monaghan went back to the tavern, fetched an acquaintance and a blowtorch, then returned to Rutledge’s store. Monaghan and his mate opened the safe while Court kept watch over Rutledge. They escaped with an unknown amount of cash, some of it burned by the torch, leaving Rutledge alone on the floor in the back of his shop, where he died some time during the night. The next day, a friend went to visit Rutledge and discovered the back door to the shop unlocked. He went in and found Rutledge dead on the floor. Monaghan, however, adamantly denies going to the store with Court from the start. He said he only showed up after Court had come to the tavern to get him to help open the safe and he never even saw Rutledge. “Graham just said he’d taken care of him, that he had tied him up and secured him,” Monaghan said. “I just thought he was in another room. “I was livid when I heard the next day that he had done this to this guy,” Monaghan said. “I felt terrible. That one stayed on my conscience. Court, meanwhile, denies that he killed Rutledge. “I have full empathy for what happened to Mr. Rutledge, for his family and their loss,” Court said. The killing of William Alexander Rutledge went unsolved for five years.